Dr. Hagood has advanced training in the area of TMJ treatment through The Piper Education and Research Center, The Pankey Institute for Advanced Dental Study and Spear Education, where he serves as visiting faculty, and the Eubank Institute. He has been successfully treating TMD/TMJ for over 20 years. The Nature and Treatment of TMJ / TMD. The temporomandibular joint (TMJ) system is a very flexible system with bones bending, muscles moving, and ligaments stretching. Additionally, the jaw joints are influenced by the teeth and bite of the individual as well as by habits like teeth clenching or teeth grinding. Temporomandibular Joint Disorder (TMD) is a collective term referring to a number of clinical problems involving the temporomandibular joints and associated muscles and structures of the area. TMD is thought to be fairly common as several researchers have found clicking and popping noises in the jaw joints to be present in 40-60% of the general population. 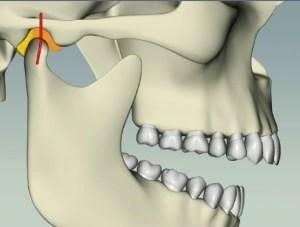 Considering that normal healthy jaw joints are completely silent always, the 40-60% figure is rather staggering to consider. Many patients come to Dr. Hagood with tender facial, jaw, and neck muscles related to TMD. About 95% of his patients will experience elimination of TMD discomfort over the course of TMD therapy and restorative dental treatment. The remaining 5% are highly likely to be treated successfully with surgical intervention. TMD symptoms are quite variable in nature, with most being a mild annoyance. However, a small percentage of patients with have symptoms which degenerate into crippling chronic pain and limited jaw mobility. A recent National Institute of Health study indicates that over nine million Americans suffer from TMJ pain on a regular basis. Medical specialists may not be aware of the link between a patient’s occlusion (bite) and the head and neck pain the patient suffers. The way the teeth come together when the jaw functions may have interferences (tooth on tooth points of contact that halt ideal harmonious motion). As the body adapts masticatory function to go around these obstructive points of contact, significant stress is placed on the muscles and tendons of the masticatory system, setting up a painful inflammation in the muscles and jaw joints. Add to this the tendency for TMD sufferers to also be bruxers (teeth grinders during the night) and jaw clenchers during periods of stress, and you end up with a perfect storm for greater inflammation and damage to jaw joints and tooth enamel. Most people with TMD are not aware of what a correct bite feels like because they always have had a conflict between their teeth and jaw. Dr. Hagood can diagnose the occlusal problems that are causing a patient’s TMD symptoms, treat the inflammation, and correct the bite. Wearing a custom orthotic appliance (bite splint) during the night provides almost immediate relaxation of overworked muscles and tendons so the body to heal. As inflammation goes down, the jaw works more comfortably and Dr. Johnson can make occlusal modification to the teeth to create a lasting harmonious function between the teeth and jaw. Dr. Hagood has devoted hundreds of hours of advanced dental training to the study and treatment of TMJ disorders, and has extensive training with The Pankey Institute in Key Biscayne, Florida. The Pankey Institute specializes in the study of occlusion (bite) and treatment of TMJ disorders and is considered by many to be the world’s leading institute in its research and treatment. It is Dr. Hagood’s goal to achieve maximum improvement with comfort and normal function, while using the least invasive and conservative treatment possible. For most patients, the ideal result can be achieved, while for others, depending on the nature and stage of the illness, effective management is the maximum goal. Depending on the nature and severity of an individual’s condition, the appropriate therapy is determined. For some, simple treatment designed to relax the muscles and reduce inflammation such as splint therapy is used. For others, more comprehensive diagnostics and dental restorations are needed. Dr. Hagood will thoroughly examine the jaw joints, associated muscles, and dental occlusion (bite) to determine correlations between findings and symptoms. One diagnostic tool is Doppler auscultation, the same technology used to listen to an unborn child’s heartbeat. Doppler auscultation is used to listen to the TMJs while in motion. The noises are compared to that of normal joints aiding correct diagnosis. Dr. Hagood is one of a few doctors in the state of Florida who utilizes joint vibration analysis (JVA). A JVA recording is painless and takes only a few moments. This is how it works. Human joints have surfaces which rub together in function. Smooth, well-lubricated surfaces in a proper bio-mechanical relationship produce little friction and little vibration. If the TMJs have suffered degeneration, tears, or displacements of the disk, friction and vibration will be evident. 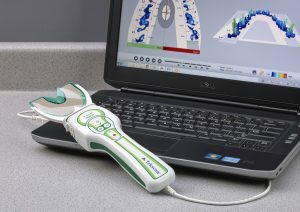 Different disorders can produce different vibration patterns or “signatures.” PC-assisted vibration analysis identifies these patterns and helps Dr. Hagood distinguish among various TMJ disorders. To understand better how the TMJs work, the JVA procedure, and the value of having JVA, view Dr. Hagood’s video about TMJ solutions predictably achieved with JVA as part of the diagnostic workup. Dr. Hagood may choose to evaluate a patient’s bite by mounting study casts of the teeth on a bite machine (articulator). This enables him to study the relationship between the jaw joints and bite in fine detail. Often, fine detail changes to this relationship can create life changing relief of common TMD symptoms. The heart of T-Scan technology is a disposable, extremely thin, flexible sensor. By biting and chewing against the sensor, a three-dimensional view of your bite is displayed on our computer screen. We can then easily adjust the bite and check our work with the sensor. The process is repeated until the biting forces are equalized. Dr. Hagood also is trained to order and interpret advanced imaging of the jaw joints and in more advanced cases, may order Magnetic Resonance Imaging (MRI) and/or Cone Beam Computerized Tomography (CBCT). These images are often helpful in determining more detailed diagnosis of joint pathology and in determining appropriate treatment. Initial treatment for TMD can range from resting the joints, switching to a soft diet and prescribed medication to stabilization of the joints using a specially designed and custom adjusted hard acrylic orthotic appliance that fits on the top of the teeth. This appliance, when properly designed, redistributes the stresses on the TMJs, and muscle system while specifically guarding and guiding certain joint movements. Injections into the joints are also used on occasion to diminish inflammation and encourage ligament repair. Therapeutic massage, in combination with an orthotic appliance is more beneficial for some patients, as well. View Dr. Hagood’s video about one of the newest tools available in the treatment of TMD, The MLS Cold Laser. Once inflammation is reduced and the jaw joints seat properly in place, the occlusal surfaces of the teeth can be modified to create a harmonious occlusion. In many cases, orthodontic realignment of teeth will maximize long term masticatory harmony and TMJ health. As Dr. Hagood restores teeth (for example, with crowns, veneers, and implant restorations), he perfects the occlusion of the restorations and opposing teeth to always improve and maintain a healthy occlusion. Are You Experiencing TMD Symptoms? Because the nature of TMJ problems is often confusing and complex, we request that you begin a relationship with our practice by scheduling a Pre-Examination Consultation. At that time, you can share with us the nature and duration of your problem, previous medical and dental history regarding the problem, and more. This first visit will take about 15-30 minutes and will not require any paperwork. The purpose of the visit is to clarify the nature of your problem. It will allow Dr. Hagood the opportunity to determine whether or not he can help with your problem or refer you to an alternative medical professional as we do not want to waste your time and money by starting in the wrong place. There is no fee for this first visit. Give us a call today!